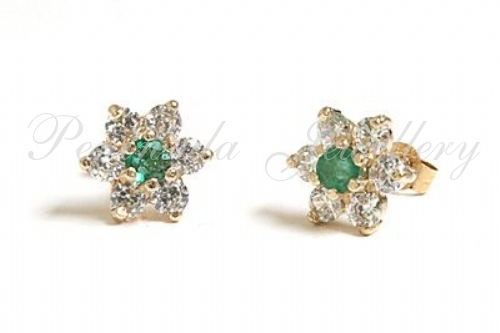 Pretty studs featuring six 2mm round brilliant cut CZ gemstones which have been claw set in the shape of a flower, with one 2mm Emerald in the centre. Complete with 9ct gold fittings. Dimensions: 8mm diameter (maximum). Total gemstone weight: 1.4ct. Made in England. Supplied in a luxury gift box - Great Gift! !